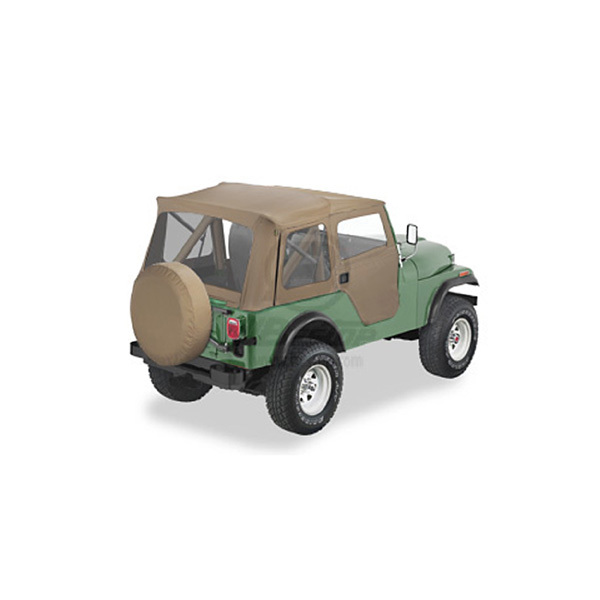 SUPERTOP, TAN 76-83 CJ5 - Jeep Parts Guy - All the Jeep Parts You Need! Supertop kits include hardware, soft top fabric and windows. For unsurpassed appearance and durability, the premium fabric maintains shape in any temperature, is mildew resistant, contains uv inhibitors and is offered in factory original any temperature, is mildew resistant, contains uv inhibitors and is offered in factory original colors. Patented Belt-Rail™ attachment system enables fast, easy installation. hardware is chemically treated and powder-coated for rust resistance to ensure long life. Tailgate bar allows you to open the tailgate without opening the rear window for trouble-free access. heavy-duty molded tooth zippers allow for easy window installation and removal. Sealed seams mean water-tight protection. Industrial strength thread ensures durable soft top construction. Replaceable heat-sealed windows meet U.S. and Europe regulations.